So, wine lovers, it’s Wednesday already and have I got an interesting wine for you this week! It’s a long story, bear with me! My bank has a points based loyalty thing with my credit card that accumulates a point for every $ spent on MasterCard and 2 points for every $ on American Express. It’s the same account for both cards, so it doesn’t matter which one I use – anyway – normally these reward schemes are pretty crap, but not this one. I get loads of free stuff for my points – and they do wine!! As I use the credit card for *all* our household expenses and then pay it off at the end of every month (to enable mortgage offset – even more savings to be had there – reduces mortgage interest payments massively) – I rack up the points pretty quickly. Coupled with the UK trips and other big ticket items, the points really end up being very worthwhile. This last year, I’d racked up so many points that I could get, totally free of charge, 3 cases of wine, plus a load of bonus wines in some of the cases. I also got a super sharp knife, some Scanpan saucepans and some other bits and bobs. Way better than airmiles, which generally don’t add up to that much and are hard to spend. 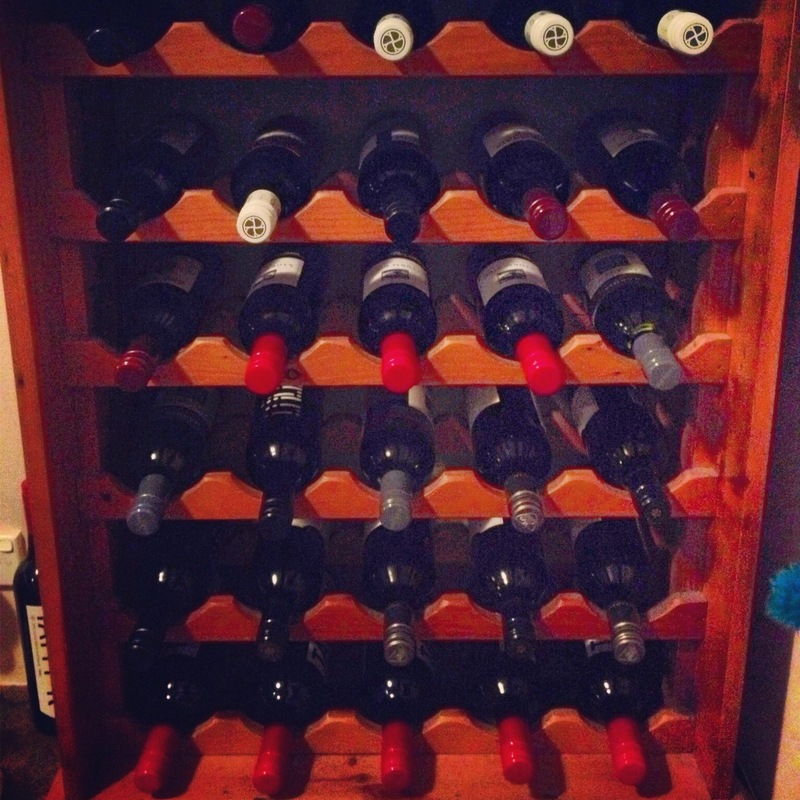 So I ended up with a full wine rack and more besides. And amongst these cases of gloriously free wine, was this one! 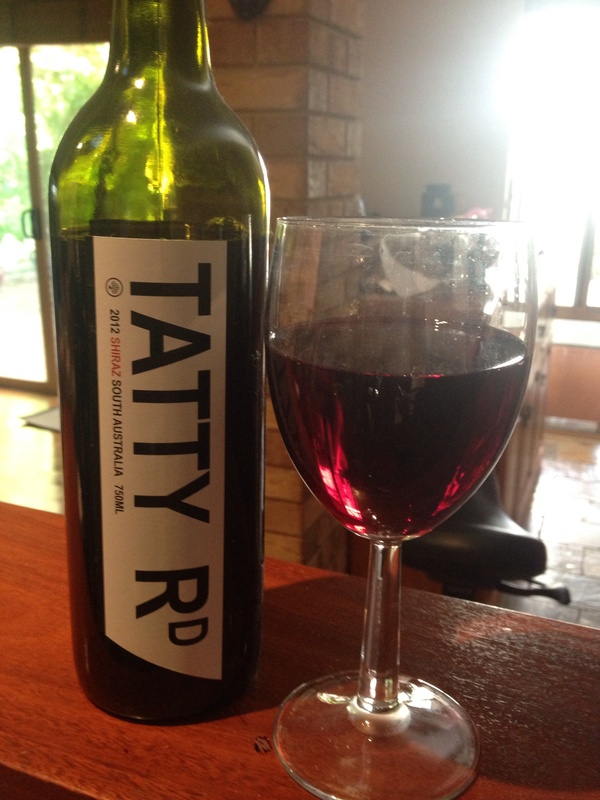 Tatty Road Shiraz, 2012 from Gemtree Vinyards in McLaren Vale, South Australia. The eagle eyed amongst you might recognise a few things. Shiraz, South Australia – yes, that’s spice country! So, what’s this wine like? Presentation: Nice and modern, the sideways label draws the eye in from a long way off. It’s bold, simple and effective. Appearance: This wine is a lovely pale cherry/damsony colour – normally I take the shots in the dark after work, but due to the slight retrenchment, I’m at home, which means daylight wine. Actually, in less bright light, it’s darker, thicker and less translucent. But I guess the relative youngness – 2012 – it’s almost Beaujolais fresh, means it’s going to be lighter than one from 5 years ago. Aroma/Smell/Bouquet: It’s got quite a nice punch to it – I was expecting it to be lighter given the year and the colour, but there’s a wealth of dark fruits, some blackberry and something darker, velvety underneath – rich chocolatey notes perhaps. There’s some of that shiraz spice and also a hint of oak and cinnamon. Not young and clean after all then! Taste/Palate: Full of smooth juicy yumminess! It’s cram packed with a dark(ish) juicy fruit hit – and quickly backed up with a spicy peppery South Australian shiraz punch which picks up nicely. There’s a little slight dip in the late mid palate where the spice tails off for a minute to let the dark fruit back in before it picks back up again. Yes, it really did do that. Finish: It tails off with quite a spicy tannin-laden finish, full of subtle velvety smoothness. There’s a hint of vanilla too I think – it’s very rewarding and well balanced and leaves you wanting another glass or two. Score: 8/10 – A really nice wine that I thoroughly enjoyed. More! I notice the 2010 vintage won gold awards – this 2012 is no slouch either. Tatty Road – one to watch. And drink. Always good to learn about Aussie wines that we don’t commonly see here in the US. Cheers.